NEW YORK, April 13, 2019 – Pitcher, a leading sales enablement platform, has been ranked a top 10 performer in Research in Action’s Vendor Selection Matrix™—Sales Engagement Management SaaS and Software: The Top 20 Global Vendors 2019 report. Research in Action’s report is based on survey data collected in Q4 of 2018 and Q1 of 2019, covering 1,500 business and IT managers in a combined telephone and online survey. Research in Action collected more than 45,000 data points for evaluation. Pitcher performed so well in the rankings because the company’s offerings reflect many of the top priorities of company representatives who are evaluating Sales Engagement/Sales Enablement software. According to the research, the leading feature driving investment in Sales Engagement/Sales Enablement software is the ability to make all relevant content assets available to salespeople, which is one of Pitcher’s primary features. Similarly, when respondents were asked what their top three priorities are when considering a new Sales Engagement/Sales Enablement vendor, the top three responses were “Solution fit to customer requirements,” “Local (regional support) and “SaaS platform,” all of which describe Pitcher and the company’s preferred method or working with customers. 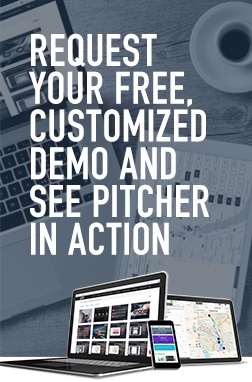 To experience Pitcher first hand, interested parties can request a demo at pitcher.com. Pitcher is a leading provider of mobile sales enablement and content management for field sales and marketing teams. With an intuitive and feature-rich platform, Pitcher’s cloud-based software makes it easier for field sales and marketing professionals in industries such as life sciences, consumer packaged goods, financial services, and manufacturing to plan for, execute, and analyze their business meetings. The immersive, feature-rich software can be executed across various desktop and mobile devices to better engage customers and field reps throughout the entire sales and marketing lifecycle. Headquartered in Zurich, Pitcher serves hundreds of customers across the globe with international offices in New York City, Barcelona, Istanbul, Tokyo, and Singapore. For more information, visit http://www.pitcher.com and follow on Twitter @Pitcherdotcom.